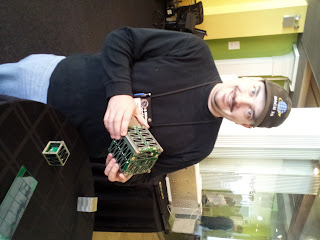 This weekend Josh and I had the great pleasure to attend Kentucky Space's hackerSPACE Workshop. The hackerSPACE workshop, led by Bob Twiggs co-creator of the CubeSat standard, was an introduction to CubeSats for hackerspaces, entrepreneurs, and educators. In addition to the formal presentations, there were a number of group suggested breakout sessions including ones on educational outreach, open source CubeSats (of course, I suggested this topic), working with Amateur Radio operators, and operating high altitude ballons. I am very happy to report the open source CubeSat topic generated quite a bit of additional conversation and opened the door to several partnership opportunities. It turns out Josh and I sat next to Adler Planetarium's Ken Walczak. Ken and I talked at length about the Far Horizons program and launching high altitude balloons. It turns out Adler Planetarium has been looking for a way to share the designs and procedures for their high altitude balloons in support of their educational mission. It just so happens, Mach 30 has a website for sharing open source hardware projects, and as mentioned earlier, a desire to build its own high altitude balloons. There has also been talk at Dayton Diode about building a high altitude balloon as a group project just because it would be cool. Sounds like a great partnership opportunity to me. Here's how I see it working. Mach 30 would provide project coordination, funding, and hosting (on Open Design Engine). Dayton Diode members who are interested in a high altitude balloon project would volunteer their time to build and operate the balloon. And Adler Planetarium would provide the experience (in the form of plans, procedures, and training). Ken from Adler has already expressed an interest in this proposal, and believes he can arrange for a live training opportunity for Dayton Diode members at one of the upcoming Far Horizons launches (the next one is in December). And Mach 30 has funds allocated for a high altitude balloon project. So, what do folks think? Is there still interest at Dayton Diode in a high altitude balloon project? Note - this post is cross posted on Mach 30's blog. Aviation Week (11/22, Morring) reported, "Cubesats - the small, cheap spacecraft popular with engineering students due to their hands-on appeal as teaching tools - are attracting attention beyond the academy as their capabilities grow and launch opportunities proliferate." NASA's new CTO, Mason Peck, spoke about cubesat advances although he noted he was only speaking as a Cornell professor since he has not officially begun his new job. Peck "has seen the nascent cubesat industry mature to the point that commercial companies are offering cubesat components, allowing students to be as creative as they might once have been with a pile of Lego building-block toys." Some schools have a "very active program," most notably because of NASA-backed research, but "students got a hard look at the downside of the technology last year when a Taurus XL launch vehicle carrying the agency's Glory satellite failed to reach orbit." The complete upstream changelog is available at http://hamlib.sourceforge.net/NEWS and there is more general information on the project's wiki at http://www.hamlib.org. The FUNcube is a radio peripheral specifically for talking to cubesats. One of the NASA guys at hackerSPACE mentioned this one as a quick way to get a ground-station up and running. Space News reports (Leone, 6 Feb 2012): Three experimental satellites powered by consumer smartphones will hitch a ride to space on Orbital Science Corp.’s Antares medium-lift rocket when that vehicle makes its maiden flight from the Wallops Flight Facility in Virginia later this year. Linux for Devices reports (Brown, 2 Feb 2012): German manufacturer Golden Delicious has begun shipping a hackable open source smartphone that runs a variety of Linux software, including a newly optimized Openmoko distro. The Openmoko GTA04 is available as a finished phone or as a board that slips into earlier Openmoko Neo Freerunner GTA01 and GTA02 cases, providing an 800MHz Texas Instruments DM3730 processor and a full range of sensors and wireless features. Good related thread on our list.